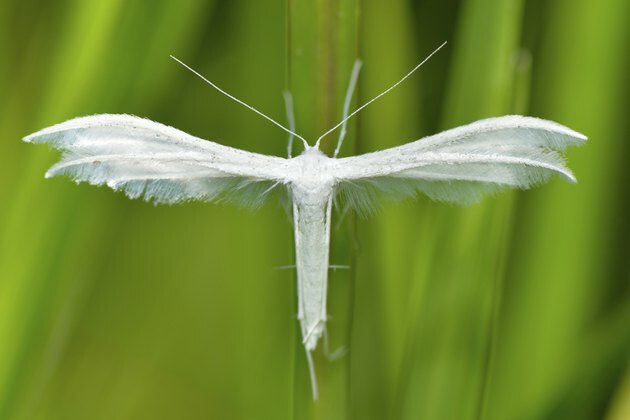 Small white moths, often called lawn moths, are a common sight in lawns and grasses throughout North America. The moths themselves don't cause a great deal of damage to grass and other plants, but their larvae do. In larval form, these moths are small worms or caterpillars that collectively are called sod webworms. These webworms are a common pest in domestic gardens, especially when lawns are stressed with heat and drought. Some lawn grasses are naturally resilient to sod webworm damage. Tropical sod webworm (Herpetogramma phaeopteralis) is one of the several lawn moth species found in warmer areas of the United States. This insect maintains a strong presence in humid, semi-tropical climates like that of Florida and neighboring states. Other sod webworms include the larvae of the lucerne moth (Nomophila noctuella) and western lawn moth (Tehama bonifatella). These sod webworm species are often lumped together because of the similarities in their life cycles and impact on plant life. The adult moth form of sod webworms are often small, with wingspans ranging from 1 to 2 inches. They lay dozens of eggs on the blade-like surfaces of lawn grasses one or more times each year. This allows multiple generations of some webworm species to exist simultaneously. Species such as the bluegrass sod webworm (Parapediasia teterrella) produce two generations per year, while others may only produce a single generation. Larval worms emerge from the eggs one to two weeks after they are laid. The larvae feed on the foliage of their grassy host for several weeks before maturing into adult moths. Damage caused by sod webworms can seem to occur suddenly, with little warning of infestation beforehand. Heavily infested grass often turns brown and decays quickly. This damage often accompanies damage from environmental stress or disease. While sod webworms attack nearly every type of common lawn grass, they are often a more serious threat to rarer, local grass species. Grasses hit by the stresses of drought conditions or heavy foot traffic tend to suffer more severely from an infestation of sod webworms. Adult moths are the most obvious sign of an infestation of sod webworms, but they usually do not emerge until mid or late summer. Since most of the damage caused by these insects occurs during the spring and early summer, it is critical to identify an infestation as soon as possible. Most sod webworms dig into the surface of the soil where they rest during the day. They come out at night to feed, which makes it even more difficult to find and identify them as the cause for damaged or dead grass. Pouring a mixture of water and dishwashing detergent over a potentially infested area will cause the larvae to emerge from their hidden tunnels. While sod webworms can be chemically treated, correcting underlying problems often makes chemicals unnecessary. Except in the most severe cases, the presence of the insects causes problems only when grass is unhealthy and stressed. Drought and close mowing are major reasons sod webworm damage becomes visible. Regular watering and taller mowing, never removing more than one-third of the grass blade at a time, reduces sod stress. This allows grass to grow out and overcome the problem. Planting resistant grass species also helps. Warm season turf grasses that thrive in heat are more resistant to sod webworm damage than cool season grasses. Why Is My Lawn Infested With Crickets? What Are the Treatments for Army Worms on a Lawn?